Professor Wool’s work examines questions of personhood and the body at times when the body—both its fleshy contours and its social entailments—becomes unsteady. These interests are rooted in her ethnographic field research with grievously injured American soldiers and their family members. They extend to broader questions about the social, cultural, ethical, intimate, carnal, and clinical situations within which such special categories of life, death, and personhood accrue value or are debrided of it in late liberal democracies. 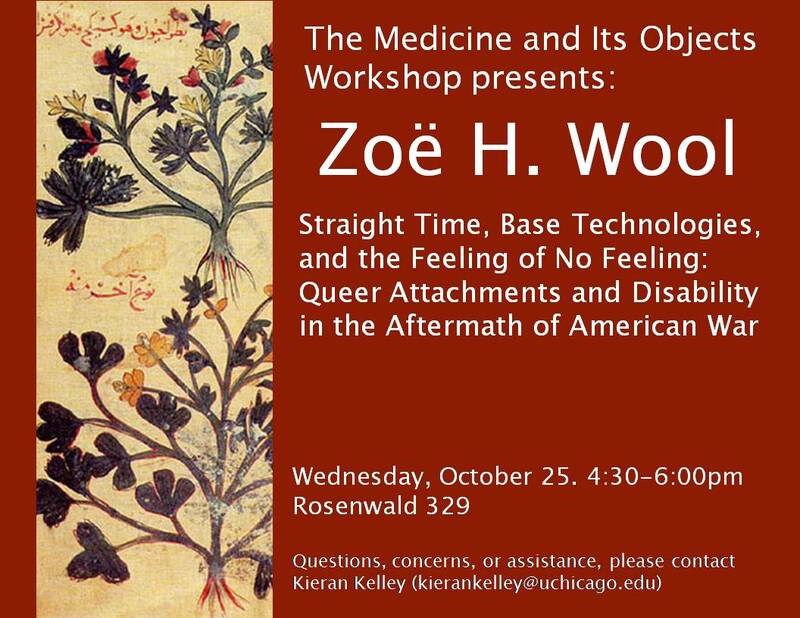 In addition to anthropology, Professor Wool’s work draws on queer and critical theory, critical disability studies, and studies of public culture to address questions of debility and intimacy; personhood and the body; war, trauma, and modern medicine; and the fleshy contours of worthy life in the contemporary United States. NB: There will be no pre-circulated paper for this workshop. As part of her visit, we will have student coffee hours at 12:15 and 1:30 in Foster 108, and a dinner following the workshop. © 2019 Medicine and its Objects. Theme by Anders Norén.